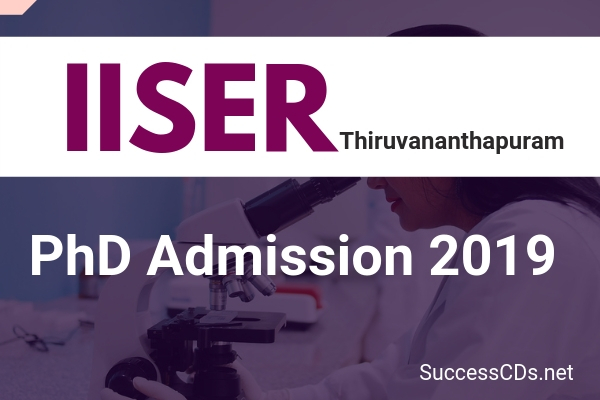 IISER TVM PhD Admission 2019 - Applications are invited from highly motivated students for admission to the Ph.D. Programme of Indian Institute of Science Education and Research – Thiruvananthapuram (IISER-TVM), starting August 2019. Computational Sciences: Numerical Functional Analysis/Mathematical Finance/Financial Engineering/Mathematical Biology/Data Science Research/Applied Cryptography. Only candidates whose ranks make them eligible to avail Category 1 DBT-Junior Research Fellowships tenable at any university/institution in India. Fellowships restricted to join DBT or ICMR sponsored projects are not eligible. GATE (EY) qualified candidates are eligible only for Ecology, Evolution and Behavior. GATE exam scores for other subjects will not be considered for PhD admissions to School of Biology at IISER-TVM. Candidates who have appeared for the JGEEBILS 2019 test are eligible to apply. JGEEBILS candidates will be shortlisted by IISER TVM PhD Applications shortlisting committee based on the marks provided by the JGEEBILS examination organizers. The candidate must have a Master’s degree in Chemical Sciences with 60% marks or equivalent [See point-1 under the heading "Important Points for all Schools" below for relaxation in the eligibility criteria]. The candidate must have qualified either of CSIR-JRF/UGC-JRF/GATE examinations valid as on August 2019 or DST INSPIRE PhD fellowship [See point-2 under the heading "Important Points for all Schools" below for INSPIRE PhD fellowship]. Master’s degree in Physics, Materials Science or Engineering in areas closely related to the interests of the Physics faculty at IISER TVM. 60% marks or equivalent is required. Having qualified in one of the following national level examinations with validity as on 1st August 2019: GATE/CSIR-UGC-JRF/UGC NET-JRF/JEST-2019/INSPIRE Ph.D. Fellowship [See point-2 under the heading "Important Points for all Schools" below for INSPIRE Ph. D Fellowship]. Qualified for CSIR/UGC-JRF/GATE/INSPIRE Ph.D. Fellowship/NBHM JRF Fellowship, valid as on 01 August 2019 [See point-2 under the heading “Important Points for all Schools” below for INSPIRE Ph. D fellowship]. Master's degree in Engineering / Technology in a relevant area with a minimum CPI of 6.5 (or 60% of marks) with valid GATE score as on 01 August 2019. Bachelor's degree in Engineering / Technology in a relevant area with a minimum CPI of 7.0 (or 65% of marks), and a CSIR-UGC-JRF/NBHM JRF (or qualified NBHM JRF Scholarship Written Exam 2019 and have received the NBHM interview call letter) /GATE Fellowship valid as on 01 August 2019. Shortlisted applicants will be invited to attend an interview at IISER-TVM. The selection of the candidate will be based on the performance in the interview. Based on the number of applications received, the applicants will be shortlisted for a written test or interview. The selection will be based on the performance of the candidate in the written test and or interview.